HMS Shannon was an 18pdr-armed, 38 gun, Fifth Rate frigate of the Leda Class, built under contract by Josiah and Thomas Brindley at the Quarry House Shipyard at Frindsbury. She became one of the most famous ships of her time as a result of her emerging victorious in what is the most famous single-ship action in the history of the age of sail. The Leda class were a group of 47 sailing frigates built for the Royal Navy between 1800 and 1826, 17 of which were built in Kent shipyards, nine at the Royal Dockyard at Chatham, including the lead ship of the class. 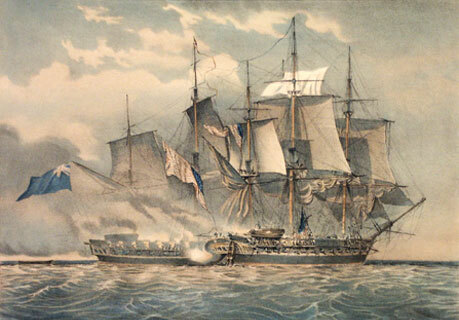 Their design was copied from that of a French frigate, the Hebe, captured by the Royal Navy in 1782. Fast, powerful and manoeuvrable, their design was very successful. There are two Leda Class frigates still in existence; the oak-built HMS Unicorn, built at Chatham Royal Dockyard and currently preserved in Dundee and the teak-built HMS Trincomalee, built in Bombay and now fully restored and on display at Hartlepool. The contract for the construction of HMS Shannon was signed on 23rd October 1803 and the ship's first keel section was laid at the Quarry House shipyard in August 1804. HMS Shannon was one of a pair of Leda Class ships ordered from Josiah and Thomas Brindley, the other being HMS Pomone. The ship was launched with all due ceremony into the River Medway on 5th May 1806 and was taken the mile or so downstream to the Chatham Royal Dockyard, where she was fitted with her guns, masts and rigging. HMS Shannon was commissioned at Chatham on 3rd August 1806 under Captain Phillip Bowes Vere Broke. On completion, HMS Shannon was a ship of 1,062 tons, she was 150ft 2in long on her gundeck, 125ft 6in long at the keel and 39ft 11in wide across the beam. She was armed with 28 18pdr long guns on her gundeck with 6 32pdr carronades and 8 9pdr long guns on her quarterdeck and 2 32pdr carronades and 2 9pdr long guns on the forecastle. In addition to her main guns, HMS Shannon was also fitted with around a dozen half-pounder swivel guns fitted to her quarterdeck and forecastle handrails and in her fighting tops. Because at the time, carronades weren't included in the rated number of guns, she was officially rated as a 38 gun 5th rate ship, although in reality, she actually carried 46 guns. The ship was manned by 284 officers, seamen, boys and Royal Marines. Captain Broke was unusual in that he was not educated 'on the job' at sea. Instead, he was educated at the Royal Naval Academy, which he joined in January 1789 at the age of 13. Appointed Midshipman in August 1793, he was serving as Third Lieutenant in the old 12pdr-armed 32 gun frigate HMS Southampton at the Second Battle of Cape St. Vincent in 1797. He first held a command when he was appointed Master and Commander in the small 14-gun brig-sloop HMS Falcon in May 1799. His appointment prior to HMS Shannon was as Captain in the 12pdr-armed 32 gun frigate HMS Druid. Captain Broke was a firm believer in gunnery and drills and once appointed to command of HMS Shannon, he had all her crew drilled extensively with their guns and rehearsing every imaginable combat scenario, to the point where everyone knew everyone else's job, officers included, and could improvise and adapt to any situation to the point of perfection. Broke was determined that his ship would be the best in the Royal Navy. HMS Shannon was immediately assigned to blockade duty off Boulogne, being part of a squadron commanded by Commodore Owen. On 8th October 1806, HMS Shannon bombarded Boulogne with Congreve Rockets. After the Battle of Trafalgar, the French Navy was unable to pose a serious threat to the security of the nation and the Royal Navy was able to spare ships for missions other than blockading French, Spanish and Dutch ports. HMS Shannon was dispatched to protect the whale fishery off Greenland. She sailed there via Spitsbergen in the Arctic Ocean in company with the smaller 36 gun frigate HMS Meleager and the two ships took the opportunity to undertake surveys of the area. After reaching a latitude of approximately 80 degrees north, the ships were stopped by ice, so turned westward, arriving off Greenland on 23rd July 1807. By autumn that year, HMS Shannon was operating in UK waters again, patrolling the Northern Approaches based out of Shetland. On 28th September, the ship put into Portsmouth for a refit. In November 1807, the French invaded British ally Portugal, thus starting the campaign known today as the Peninsular War. This presented the British with a problem in that the Portugese island of Madeiera was a major stopping point for British ships, both warships and merchant ships, on their way down the western coastline of Africa. If the French occupied the island, it would cause major disruption to British trade routes to southern Africa and beyond to India and the East Indies. The British decided to invade the island and Rear-Admiral Sir Samuel Hood was given the job of escorting a convoy of troopships carrying a force under Major-General William Beresford intended to occupy the island in the name of the King of Portugal, who had been forced to flee with his court and the entire Portugese Navy to Brazil. Hood's force in addition to HMS Shannon comprised his flagship HMS Centaur (74), plus HMS York (74), HMS Captain (74), HMS Intrepid (64), the ex-French 18pdr armed 38 gun frigate HMS Africaine, the ex-French 18pdr armed 38 gun frigate HMS Alceste and the ex-French 12pdr armed 32 gun frigate HMS Success. The force anchored in Funchal Bay about a cable's length (1,200 ft) from the beach and landed the troops without opposition. The troops quickly took possession, again without opposition, of the forts overlooking the bay and on Boxing Day 1807, the Portugese governor, Pedro Fagundes Bacellar d'Antas e Meneres agreed to the terms of surrender. On 20th July 1808, HMS Shannon was in company with the 16 gun brig-sloop HMS Surinam and the 12 gun armed schooner HMS Eclair when they captured the French vessel Comet. On 21st August, HMS Shannon, HMS Surinam and the gun-brig HMS Martial (12) captured the French vessel Espoir. In November 1808, HMS Shannon towed the French frigate Thetis back to the UK, after the French ship had been captured by the 18pdr-armed 36 gun frigate HMS Amethyst. 1809 was spent with the Channel Fleet and got off to a good start when HMS Shannon captured the 14 gun French privateer cutter Pommereuil. The ship spent the next 2 years patrolling the English Channel before going into Plymouth on 1st June 1811 for re-coppering. After this, she sailed to Portsmouth to complete her refit and was re-stored for overseas service. By the time her refit was complete, tensions between Britain and the USA were on the increase and both sides were preparing for war. HMS Shannon was sent to Halifax, Nova Scotia and arrived there on 24th September 1811 after a trans-atlantic trip lasting 45 days. On 18th June 1812, the Americans formally declared war on Britain and on 5th July, Captain Broke was put in command of a squadron consisting of HMS Shannon, the 64 gun 3rd rate ship of the line HMS Africa, the 18pdr-armed 38 gun frigate HMS Guerriere, the 18pdr-armed 36 gun frigate HMS Belvidera and the 12pdr-armed 32 gun frigate HMS Aeolus. The squadron was ordered to carry out a blockade of American East Coast ports. The squadron's first success came on 16th July, when HMS Shannon captured the 16 gun brig USS Nautilus. That evening, the squadron sighted and gave chase to the 24pr-armed 50 gun Heavy Frigate USS Constitution. After a 65-hour chase, USS Constitution escaped into New York. HMS Shannon then escorted a convoy from Jamaica as far as the Grand Banks before returning to US waters. After rescuing the crew of HMS Barbadoes, which had been wrecked on Sable Island, together with the money that ship was carrying. 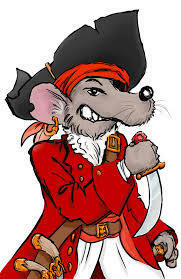 During that mission, HMS Shannon captured the enemy privateer Wily Reynard on 11th October. During the winter of 1812, the British Commander-in-Chief on the North America Station, Admiral Sir John Borlase Warren, was in Bermuda and had left Captain Broke in command of the Royal Navy's squadrons operating off the coasts of Nova Scotia, New Brunswick and New England. In December that year, HMS Shannon escorted a UK-bound convoy halfway across the Atlantic, returning to American waters via the Azores. In early 1813, Captain Robert Dudley Oliver arrived aboard his ship, the 74 gun 3rd rate HMS Valiant and took command from Captain Broke, who continued thereafter to deploy with the squadron in HMS Shannon. On 2nd April 1813, HMS Shannon was off Boston and spotted the American Heavy Frigates USS Congress, USS President and USS Constitution in the harbour there. After departing to inform the squadron of their find, another American frigate, the 18pdr-armed 38 gun ship USS Chesapeake arrived in Boston. HMS Shannon was then ordered to keep watch on Boston from close inshore in company with her sister-ship HMS Tenedos. On 16th May, HMS Shannon and HMS Tenedos chased a large armed ship flying American colours and forced it ashore. After a boat action, the enemy ship was captured and refloated. She turned out to be the French-built privateer Invincible of 16 guns, which had previously been captured by the British, then retaken by the Americans. As the Chesapeake appears now ready for sea, I request you will do me the favour to meet the Shannon with her, ship to ship, to try the fortune of our respective flags. 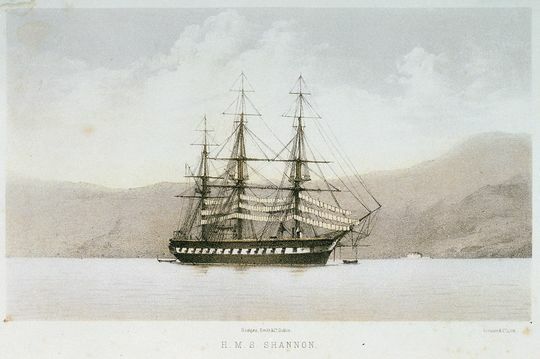 The Shannon mounts twenty-four guns upon her broadside and one light boat-gun; 18 pounders upon her main deck, and 32-pounder carronades upon her quarter-deck and forecastle; and is manned with a complement of 300 men and boys, beside thirty seamen, boys, and passengers, who were taken out of recaptured vessels lately. I entreat you, sir, not to imagine that I am urged by mere personal vanity to the wish of meeting the Chesapeake, or that I depend only upon your personal ambition for your acceding to this invitation. We have both noble motives. You will feel it as a compliment if I say that the result of our meeting may be the most grateful service I can render to my country; and I doubt not that you, equally confident of success, will feel convinced that it is only by repeated triumphs in even combats that your little navy can now hope to console your country for the loss of that trade it can no longer protect. Favour me with a speedy reply. We are short of provisions and water, and cannot stay long here. Before Mr Slocum entered the harbour however, the USS Chesapeake was seen setting sail. Captain Lawrence of the USS Chesapeake was confident of victory. Recent victories against the British by other ships together with the run-down appearance of HMS Shannon and the fact that Chesapeake had a full complement of men aboard and knowing the British ship's crew would be depleted after having to send away prize-crews had convinced Captain Lawrence that HMS Shannon would be an easy opponent to overcome. USS Chesapeake left Boston with no less than 3 ensigns flying and full of confidence, the American bore down on HMS Shannon. Both ships held their fire until the range was down to about 30 yards, virtually point blank. Now, all the years of drilling and rehearsing paid off and the action that followed was as brief as it was savage. The action is well documented elsewhere, but suffice to say, after 11 minutes of intense combat, USS Chesapeake was taken. Casualties were severe on both sides. The American captain was mortally wounded and Captain Broke had his skull laid bare by a blow from a cutlass. In all, HMS Shannon lost 23 men killed with 56 wounded, mostly during the boarding of the USS Chesapeake. The American ship suffered 60 killed with a similar number wounded. Although Captain Broke's wound was declared fatal by the ship's surgeon, he survived but never held another sea command. HMS Shannon and USS Chesapeake in action. A prize-crew was put into the USS Chesapeake and both ships arrived at Halifax, Nova Scotia on 6th June 1813. The Royal Navy had had it's honour restored by the stunning victory and Captain Broke was hailed as a hero in the mould of Nelson himself. The crew of the USS Chesapeake were imprisoned in Halifax and the ship was taken into the Royal Navy serving until 1820 when she was broken up. The dead of both ships were buried in Halifax with Royal Navy officers acting as pall-bearers for Captain Lawrence, who was buried with full military honours. Commander Humphrey Senhouse relieved Captain Broke in command of HMS Shannon and the ship departed for England on 4th October 1813, carrying the recovering Captain Broke. The ship arrived at Portsmouth on 2nd November. In September 1813, Captain Broke was made a Baronet in recognition of his victory and was given the Freedom of the City of London. USS Chesapeake was taken into Royal Navy service under her American name and served until 1819. The ship was never considered a good sailer and was sold for breaking up in July of that year. After that, HMS Shannon had a quiet career. She was in the Ordinary at Portsmouth between 1814 and 1815. Between July 1815 and March 1817 she underwent extensive repairs at Chatham before being returned to the Ordinary. In the summer of 1826, she was repaired again and recommissioned for sea service in December 1828 under Captain Benjamin Clement. HMS Shannon remained in front-line service until 1831 when she became receiving ship at Sheerness. 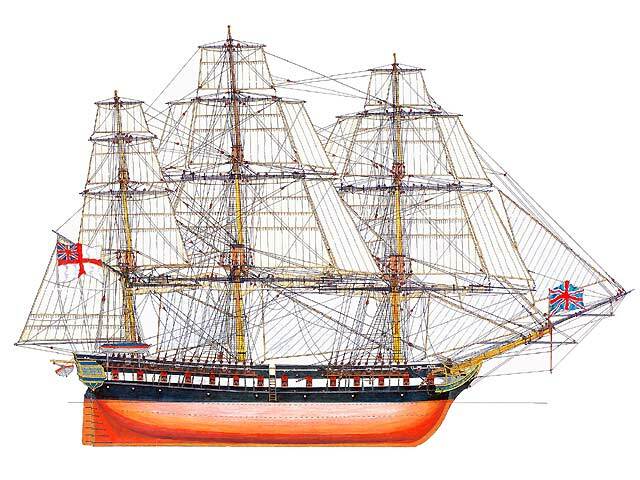 On 11th March 1844, the ship was renamed HMS St Lawrence. This was usually done when a ship was no longer seaworthy and was assigned, permanently, to harbour duties. HMS St Lawrence continued as receiving ship at Sheerness until she was towed to Chatham in 1859 and broken up.